More dogs die from the side effects of worming products than from having worms! Stop overwhelming your dogs immune systems with toxic flea and worm treatments that simply are not necessary. Don't treat prophylactically, it is totally unnecessary other than to generate profits for ruthless large corporations, vets and pet shops. Bravecto is a fairly new product to the market which is being heavily promoted for the control of parasites such as fleas and ticks. This product is being dished out like smarties by vets in many countries to unsuspecting dog owners who are not informed of the serious side effects that are associated with this product. 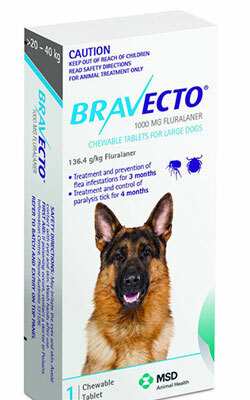 Bravecto is a neurotoxin that stays in the dog's system for 3 months, the side effects may be cumulative. There are many simple natural remedies for preventing and treating parasites without having to put your dog's life at risk. Garlic - your greatest ally in the fight against parasites. The addition of garlic to your dog's diet will protect your pets because, like vampires, nasty little parasites hate garlic!! If you can, use fresh organic garlic crushed into their food, a single clove or less for a smaller dog is enough to get rid of nasties. If you don't want to use fresh, a daily dose of a 500mg capsule will work too. 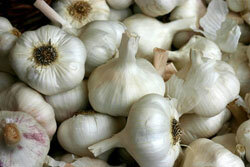 Some people think garlic is poisonous for dogs but that is not true. Read more - Garlic For Dogs: Poison Or Medicine? Now, this little devil is worth a special mention as he is a persistent little devil and difficult to get rid of. We have experienced 2 severe attacks of mange which we put down to rural living and foxes roaming around our land. Mange is not nice and very uncomfortable for any dog infested with these nasty creatures. In the most severely affected we even resorted to using toxic Advocat but it didn't work so we felt guilty about using such poisons and resorted to finding a safer and more effective remedy. This is what has worked for us, a combination of natural remedies. Pick a handful of lavender or use dried, put it into a saucepan and fill it with water (about three quarters full), boil it for 20 minutes and then leave it to cool. Add two large sliced lemons and leave the mixture overnight to infuse. In the morning put the mixture through a sieve and drain, put the fluid into a spray bottle then spray a fine mist against the grain of the coat every two days. As a prophylactic measure against fleas, ticks or mites this mixture should be used twice a week. Note: DO NOT USE ANY LAVENDER OIL as this can catch on fire when heated and also can burn the skin when applied especially in hot weather. This gorgeous smelling fluid can also be sprayed around the house without fear of any chemicals hurting you or your pets. Another bonus is that it is also a fantastic natural air freshener plus your pets smell nice too! Hydrogen Peroxide and Borax spray. The treatment requires 500 cc's of 3% hydrogen peroxide diluted in 1000 cc of water. After you have mixed the water and H2O2, add the borax. Measure 3 heaping tablespoons of borax into your hydrogen-water solution and stir until the borax is dissolved. We find it's better to boil some of the water to dissolve the borax more easily otherwise you will clog your spray. After you have created the solution, use it to rinse the animal several times. You need to soak the dog entirely, even in areas unaffected by mange. Soak the animal several times and keep it wet for a period of time. You can use a bucket or even a heavy sprayer bottle to apply the solution, but be sure to thoroughly cleanse the dog’s fur and repeat the treatment multiple times. Again, do not rinse the dog’s fur with water and do not pat the animal dry after applying the solution, as both of these limit the solution’s efficacy. You can use this solution for spraying over carpets and bedding although the lavender mix is nicer. Another natural inexpensive remedy which can be used internally and externally for parasite control. It has many other health benefits which you can discover on internet searches. For fleas, you dust your dog down and for worms, you put a tablespoon in their food every day - teaspoon for small dogs. Diatomaceous Earth can eliminate roundworms, whipworms, pinworms, and hookworms within seven days of being fed daily. 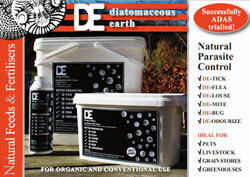 To be most effective, Diatomaceous Earth should be fed for at least 30 days, to catch all newly hatching eggs or the cycling of the worms through the lungs and back to the stomach. DE should also be used to dust down infected bedding and carpets etc. DE is a detox agent that will aid digestion and cleanse the colon. Scientific studies have shown that DE absorbs methyl mercury, e-Coli, endotoxins, viruses, organophosphate pesticide residues, drug residues, and protein, possibly even the proteinaceous toxins produced by some intestinal infections. Sprinkle some on your breakfast cereal - yes it's safe for us humans as well and has many beneficial effects. if you speak to Helen at Natural Feed Fertilisers, she is happy to give you advice. These magic seeds have been used for centuries to treat parasites in humans and recently it was discovered that they are an effective deworming agent against tapeworms and other parasitic nasties in dogs. These amazing little green gems contain the amino acid called cucurbitacin, which paralyses and eliminates the worms from the digestive tract. 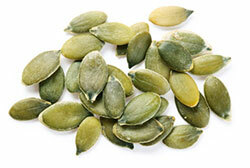 As a bonus, these seeds are loaded with protein, amino acids, fibre, iron, copper, phosphorus and magnesium, calcium, zinc, potassium, folic acid and niacin. These are all important nutrients for yours and your pet's health. To administer the seeds you need to put them in a grinder and then give 1/4 teaspoon per ten pounds of body weight (1tsp per 18kg) once or twice a day until your pooch is rid of the parasites. 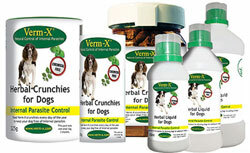 I first used Vermex when I acquired some ex-battery hens and I was told that I needed to worm them from time to time. I wanted to find something natural and safe since we give their eggs to our dogs to eat so I didn't want to use anything toxic. Vermex is in my opinion rather expensive and there are much cheaper natural alternatives. This old-fashioned remedy has so many uses, it really is a magic potion. On this page, we will just discuss the benefits of ACV for the treatment of parasites. Parasites such as fleas, ticks mosquitoes and worms do not do well in an environment that is not supportive of their life and reproductive requirements. 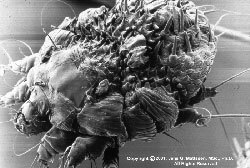 Such parasites do not like acidic environments. ACV is acidic and therefore not an attractive substance for these parasites. A tablespoon of ACV in your dog's food or water daily will deter parasites. Externally you can wet down your dog with a mixture of 1 tablespoon ACV for every pint of water. Don't dry your dog, just let him shake. 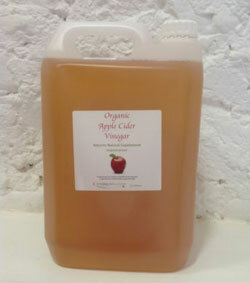 Raw ACV has many other beneficial effects and can be used for ear infections, to aid digestion and to improve skin and fur. Bill No Mates made by CSJ is an aromatic mixture of mint, seaweed, fenugreek, neem leaves and lemon balm which you simply sprinkle over your dog's food every day. It will repel lodgers and it leaves the skin and coat in great condition. It is a natural product which can take up to 6 weeks to be fully effective so it's a good idea given its benefits, to give to your dog all year round. It is very economical to use - there is a measuring scoop in the tub. 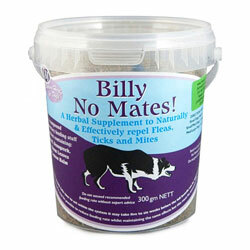 We have tried Bill No Mates tincture as well but we prefer the dried herb as it is easier to use and more economical. 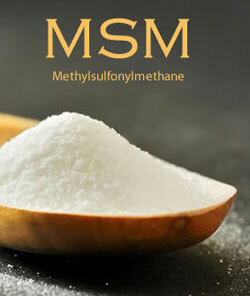 Check out the many other health benefits that MSM has and not just for your pets, it's good for you too. Both our pets and us are likely to be deficient in MSM because depleted soils have significantly lowered the mineral contents in foods overall. Processing foods will further reduce mineral content. MSM: Does Your Dog Need It?